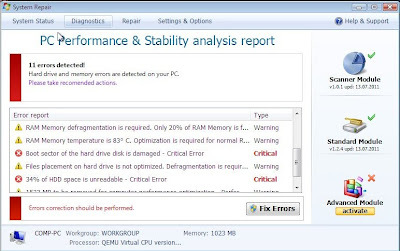 Master Utilities is a fake computer optimization software that displays fake error messages and alerts that your computer has a lot of critical problems with hard disks, memory, etc. It uses this misleading technique of most rogue programs in order to trick you into purchasing so-called full version of the software. Don’t pay for Master Utilities malware. Read a guide written below to see instructions how it can be removed automatically. Like other malicious programs from the same family of fake optimization tools, Master Utilities can be installed without you noticing that, through the use of trojans. It does not require your agreement! Remember, the scan results are a fake, this malware is unable to detect any problems. So you should never trust this fake application and ignore all that it will display you. Critical Error! RAM memory usage is critically high. RAM memory failure. Critical Error! Hard Drive not found. Missing hard drive. Critical Error! Damaged hard drive clusters detected. Private data is at risk. However, the rogue just uses the fake alerts to make the scam look more realistic. You should ignore all of them. As you can see, Master Utilities is absolutely useless and what is more, even dangerous software. Do not trust it. This is a scam. You should remove this malware as soon as you notice it installed on the system. Follow the Master Utilities virus removal instructions.